What if Ithaca were in Sonoma? A regular conversation we have at work, when trying to pick a restaurant in the Bingamton area to impress customers or to send visitors from bigger cities to, is that P.S. is awesome, but is it ok to send those folks to a strip mall in Vestal (? ), Loft at 99 is cosmopolitan, but the menu is limited, Remliks is gorgeous, but the food can be inconsistent. I'm not knocking any of these restaurants, and I eat at each of them frequently. But it's tough sometimes in these parts to put the whole package together. In Ithaca, somehow, there seems to be just enough motivation/economy to push a few special places into that desired combo of atmosphere and great food. A new spot is swinging for the fences: Coltivare. Coltivare is part high end dining experience, part teaching facility, serving as a training ground for Tompkins Cortland Community College's culinary program students, supplied by a farm run for the school, and led by the department's head professor. So you can expect a youthful vibe, inventive, locavore food, and lots of creativity. What's unexpected is the utterly gorgeous space. If you've ever watched Fixer Upper, on HGTV, just imagine you asked Jo to design a Napa Valley-esque house for you. Coltivare is what would result. White subway tile, scraped wood, dark stained tables, exposed brick and ductwork, plus tons of windows and natural light to cradle you in an environment that is both cosmopolitan and utterly relaxing. The rustic-chic decor is completely different and unique for this area. Even the interior wine cellar/private dining room is idyllic. Even better than sitting in this transporting interior is to sip a strawberry rhubarb mimosa in it. This drink was markedly less sweet than a lot of sparkling wine cocktails - the sugar content tamped down by the astringent rhubarb, but reinforced gently with the berry purée. We liked them so much, we ordered a second round. 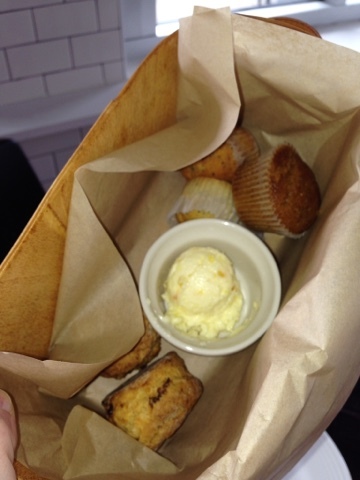 Our brunch time bread basket was laden with miniature currant scones and pumpkin muffins. 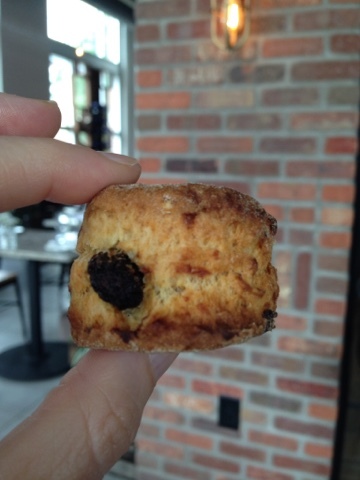 Each tiny scone was sweet, crunchy on the outside, with that dry, crumbly inside you want in a good scone. The muffins were highly spiced, tender and moist. I liked that these were diminutive, because they whetted our appetites without obliterating them. 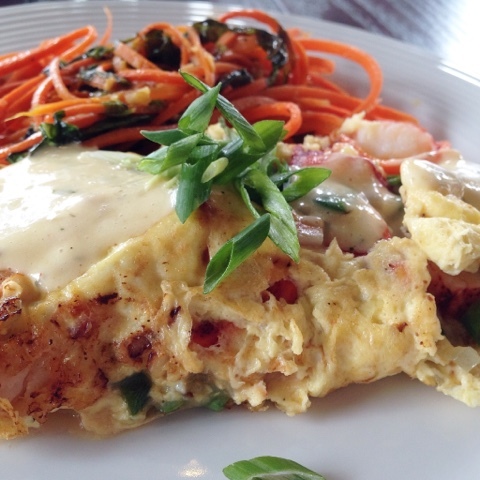 The pastrami hash had me tempted, but I went for the omelet of the day: (I can't even believe this exists) a goose egg omelet with lobster and bernaise sauce. I don't think I'd ever had goose egg before, so I wasn't sure what to expect from it. But it was delicate, tender, and light with rich flavors - just what one appreciates from a perfectly cooked chicken egg. The lobster meat leant sweetness, while the pale yellow bernaise was buttery and rich. Scallions saved it from going over the edge with their light sharpness. The one thing missing here was toast. Instead, it came with some kind of very scantily dressed carrot salad, which may have well just been shaved carrot, for all I could taste. Next to bernaise sauce, subtle flavors just don't cut it. In any event, when I eat an omelet, I need toast. I would have adored a piece of charred country bread with some tarragon-flecked butter to compliment the flavors of the dish. It felt naked without it. Big Hungry Melinda, who was celebrating her last girls' day in Ithaca before tying the knot, loves a hearty burger. I hope that hasn't changed since she got married! So the bacon egg burger got the nod. Unfortunately, her massive patty of locally raised beef was a bit overcooked. That didn't detract from the rich, savory flavors at play here, but perhaps the overall effect was impacted by a lack of juiciness. The bacon had wonderful flavor, obviously. It was from BHS favorite The Piggery. And the chewy bun was delicious with the egg. 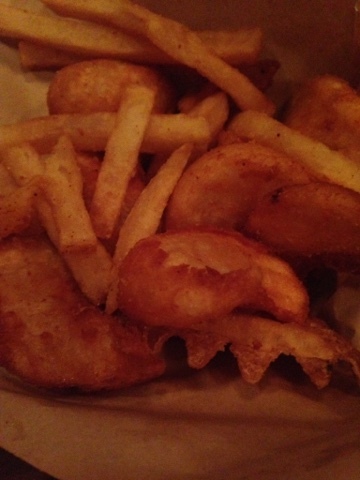 The fries were hand cut and double fried, in accordance with The Prophecy. Hallelujah. Our waiter, a young hipster, fittingly, was friendly and kind of adorable, but our meals took an inordinate amount of time to arrive. Thank goodness for that bread basket and those mimosas to tide us over. Ladies can get the vapors, you realize, when not fed properly. I'm not exactly ready to give Coltivare a rating yet. Brunch for two just wasn't enough to give us a wide sample of the food here. I can promise you I'll be back to Coltivare, and will provide a full report and a final judgement then. Meantime, during your next trip to Ithaca, you should hit it up and see what you think. If nothing else, this is a glorious place to while away the hours, and you're guaranteed some fun and different dishes. I always love eating in Ithaca, because the dining choices there are so varied and different from the 200 Italians restaurants we have to choose from in Binghamton. 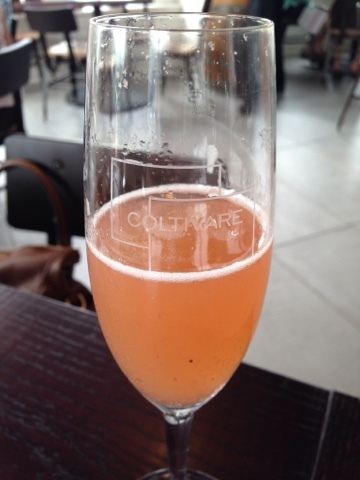 Coltivare is a somewhat stunning addition to that landscape, and I, for one, am welcoming it with open arms. My personality is big; my hunger is bigger! 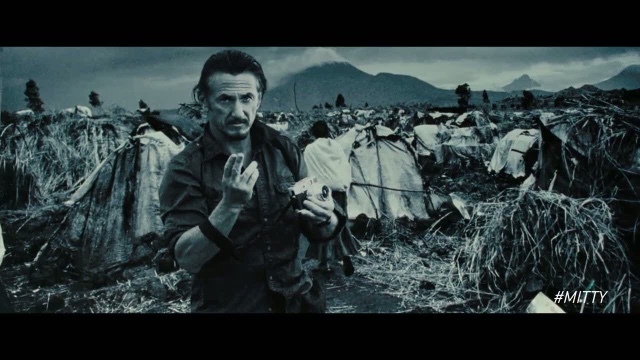 You know that scene in the latest Walter Mitty movie where the photo of Sean Penn comes to life like a portrait at Hogwarts and beckons Walter into the great wide open? If you don't, incidentally, you should. That movie's really cool and a complete cinematic eyeball treat. It makes me think, though, of how often I'm lured out and about. That as much as I crave our home, and everything it entails: nights in, cooking a homey meal for just Shawn and me and then snuggling up for a late night movie on our couch, I spend an awful lot of time traveling. That's good, because in order to write about food, I have to continually cast a wider and wider net to bring it all here for you. But it can be tough. It's not like Sean Penn up there is inviting me out for cocktails with he and Charlize every weekend. But enough bellyaching! My recent travels have taken me deep into the Poconos (no longer the heart-shaped bed capital of the Northeast), up to Syracuse for a quick brunch with a dear friend, and down to DC Metro for some girl time and great grub. Want to come along? 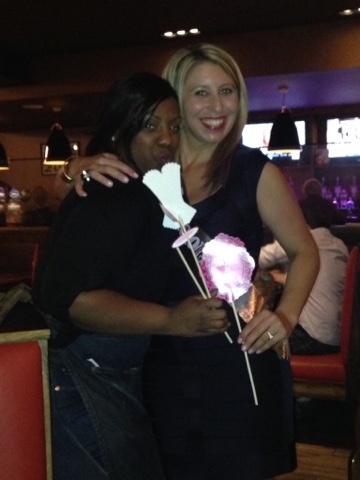 Back in May, we held Big Hungry Melinda's bachelorette party at Mounty Airy Resort and Casino, in the Poconos. This place has been around since I was a kid, and used to be the kind of getaway with in-room jacuzzis shaped like champagne glasses. It has since undergone a massive renovation and come out the other end resembling Vegas more than our beloved, but sometimes shabby, Pennsylvanian honeymoon locale. With its new pool complex, spa, and modern casino floor has come Guy Fieri's Poconos Kitchen, open all night for Mount Airy's hungry gamblers and party girls alike. Though I've read the dismal reviews on Fieri's Manhattan restaurant, I set up our girls' dinner at this new outpost optimistic at its prospects. After all, I am an admitted Diners, Drive-ins and Dives fanatic. 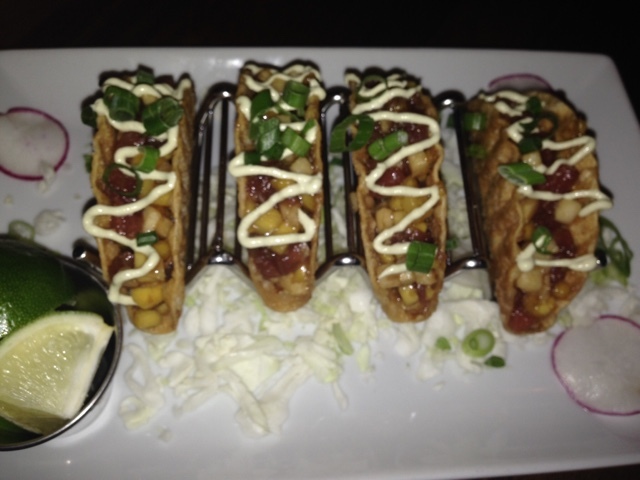 We started with some pretty on-point tuna sashimi tacos. The fish was fresh and clean tasting, diced small enough so as not to fall out of the wonton/taco shells when you bit into them, but big enough to carry good sashimi flavor. The jicama salsa provided crunch, and while the wasabi cream could have been much more pungent to suit my tastes, it was bright and sharp enough for the masses as well as to round out the dish. We gobbled these up in short order. 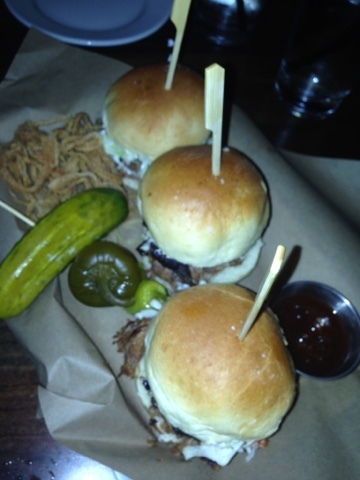 Pulled pork sliders were pretty run of the mill, for me. 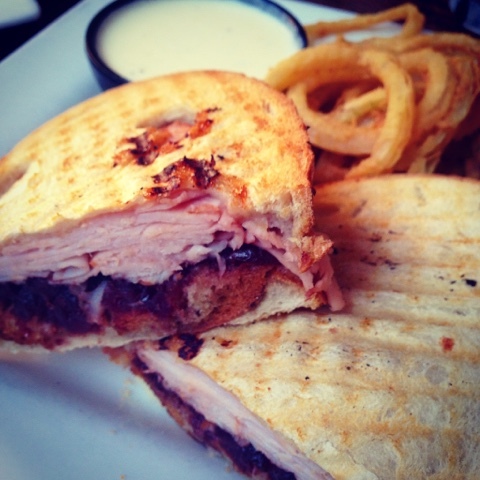 It's a shame that pulled pork and BBQ sauce have become so ubiquitous on fast-casual menus. But Guy talks all the time on TV about his competition BBQ team, right? So we tried them. The pork was tender and juicy, but the sauce was very much the too-sweet, too-thick supermarket variety, rather than true to Carolina or any other BBQ region of the country. Again, this is food to please the masses, for sure, but nothing I'd order a second time. 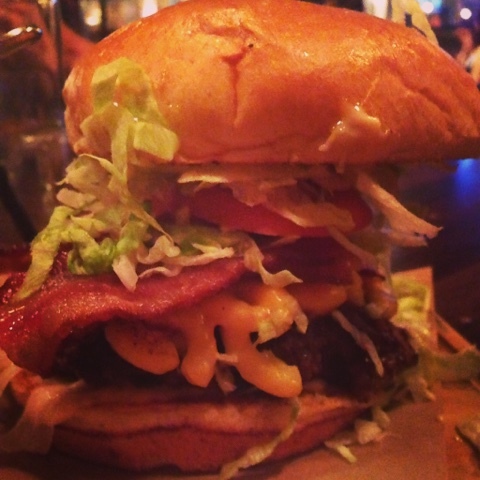 The was an insane burger on the menu topped with mac and cheese. It's really hard for me to resist ordering insane things. I should have practiced more restraint. This thing was gargantuan, but also a total mess. The mac and cheese was gluey, without any identifiable cheese flavor save American, and this donkey sauce that comes on everything, which is supposed to be the signature sauce of the joint, is just junky. Guy's version of special sauce, it's mayo mixed with some horseradish and ketchup, and it was in such abundance on my burger that the toppings wouldn't stay on the bun. They were swimming in an ocean of the stuff, sliding all over the place. It was impossible to eat, greasy in the extreme, and not great. Think: Applebee's. I've had vastly better flavored burgers at Food & Fire in Johnson City and Skewed Brewing in Watertown. To make matters worse, sandwiches at Guy's are served with a trio of from-the-freezer fried potato products, not a one with any genuine potato flavor. So whether you try a fry, waffle fries, or wedges, you'll not find a hand cut spud among them. These were pure junk food. On the bright side, our server Desiree was absolutely sublime. She was not only a good waitress who knew her menu and how to guide us through it, she also endeavored to aid in our fun evening out, posing for photos and playing along with all our shenanigans. But the food here, overall, was what I should have expected from all those snarky NYC reviews. This is a chain restaurant through and through, with little of the culinary expertise I know Guy to have. They're packing them in, though! The line was out the door the night we visited. You can take from that whatever you like. Are all those people (ourselves included) fooled by the name? I suppose so. You expect a Guy Fieri joint to have approachable food elevated above the usual processed crap. Elevation was not to be found here, alas. A few weeks ago, I met my friend Kristina for Sunday brunch at Modern Malt, a new diner in Armory Square that might have aspirations of being a bistro when it grows up. 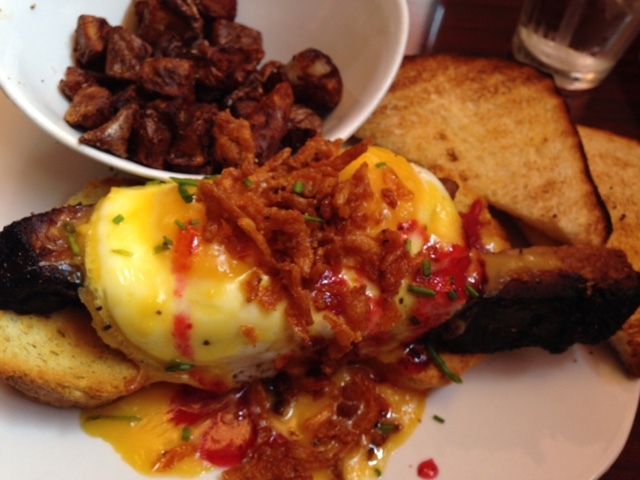 Biscuits, eggs, pork belly, hollandaise, cranberry reduction and fried onions. Oh mama! The biscuit base was definitely made by a Yankee, unfortunately. It was dry and crumbly rather than flakey and light. But the braised then crisped on the flat top belly, sunny side up eggs, rich hollandaise and tart-sweet cranberry sauce were all slam dunks. The potatoes on the side? I'll lump those in with the overcooked biscuit - they were fried to death - but let's concentrate on the positive. Modern Malt is going places, and I don't expect its tables to be empty any time soon if it keeps heading in this direction. Bottomless mimosas don't hurt, either. I will be back in the future for a full review of MM. 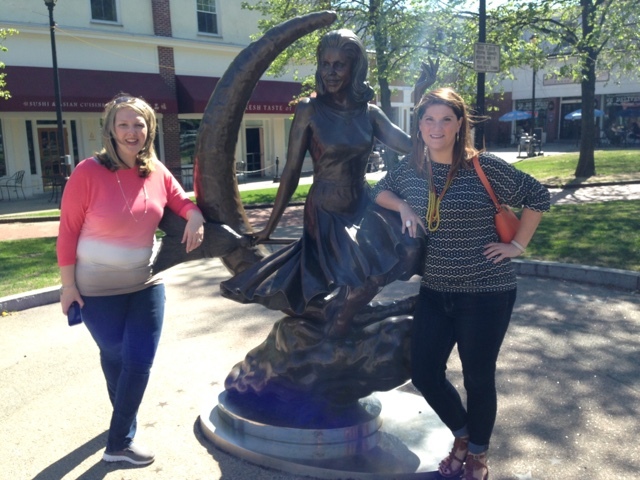 My friend Lindsay and I hadn't seen each other in too long. We had worked together in Owego for a while, so it was fitting that to reunite in Arlington, VA, we would meet at a restaurant owned by dudes from Binghamton. Liberty Tavern is a cool spot, you guys. 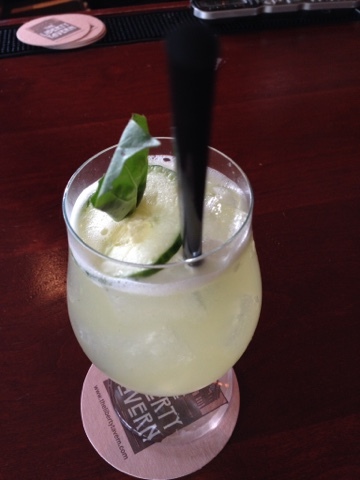 When the barmaid prepared my Bobbi Jean cocktail, she slapped the thai basil before muddling it to release its oils. Our waiter appreciated our dinnertime banter so much that he bought us dessert! Guys from Binghamton own it! You've gotta go!! 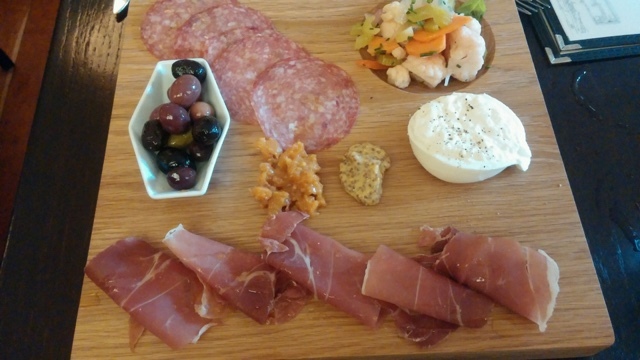 We started with an antipasti platter adorned with some of the most buttery soft prosciutto I have ever tasted. There was also a light-as-air dollop of glorious, milky burratta cheese, some mild, warm, green and black oil cured olives, and even some salty, chewy salami, sliced so thin you could see light through it. This is good eating. We both had pasta dishes, and both were excellent. 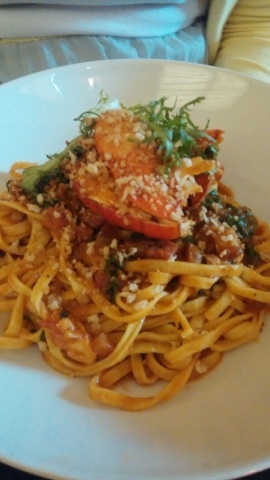 Linds went for lobster all'amatrciana - basically linguine with tomato, bacon, and onion sauce topped with a juicy, tender lobster tail. It was salty and rich, but still light, somehow. Earthy, fatty, but not heavy. The pasta had chew and the sweet lobster meat pushed that sucker right over the top into abondanza territory. 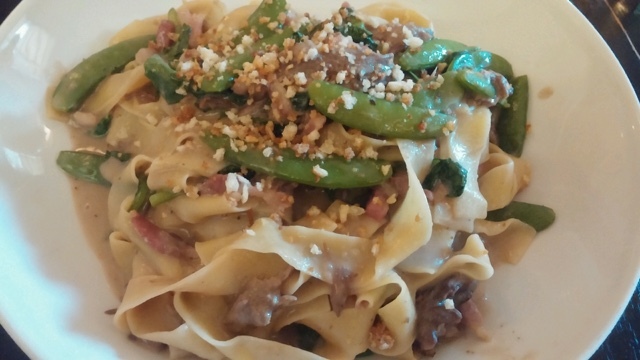 My braised lamb neck tagliatelle with sugar snap peas was even more complex. The tender, shredded, juicy lamb meat was just slightly funky/gamey, not so much as to be unpleasant, but enough to give the other, more mundane ingredients personality. The peas were bright, crisp, and sweet, a perfect contrast to the mellow, unctuous meat. The cream fraiche made a creamy, neutral base, and the toasted breadcrumbs on top gave a more robust crunch than the peas, for textural interest. The creme fraiche a (think:fancy sour cream) could have been in a bit more abundance, for me. The fresh pasta soaked up a lot of the moisture and the works got a bit gluey after a few bites - a problem easily remedied by a little pasta water or a splash of cream, but one that should be addressed in the fine tuning of this dish. I don't mind a tight sauce, but the wide pasta needs a little more help than the dairy was lending, in this case. 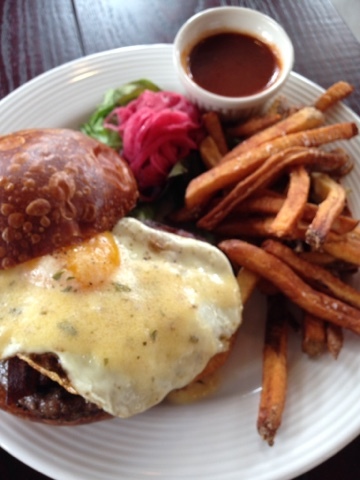 If business or pleasure takes you to Arlington, do yourself a favor and take yourself to Liberty Tavern. The food swings on the gourmet side of things in this chic, hipster/industrial interiored space, but there's plenty to find to suit any palate, and it's all delicious. I actually got to spend a weekend at home this past week, and I'll be up in Watertown this coming weekend reviewing restaurants for my column in the Watertown Daily Times. Traveling is fun, but home is just that much more delicious. My personality is big; my hunger is bigger! I have to admit to a few moments of weakness on a recent trip to Salem, Mass. On a windy night, ensconced in my hotel room, I may have believed the ghost stories told about the historic inn as a loose shutter rattled intermintantly for hours. It's hard not to let the weight and history of what went down in this small New England town get to you. The Hawthorne Hotel isn't so historic that it was standing when a bunch of puritanical nut jobs hanged 19 men and women for witchcraft, but at nearly 100 years old and standing at one end of the original Salem Village limits, the ground is certainly hallowed. You can go online and read about how haunted it is, but mostly, I enjoyed the gracious staff and comfortable bed, and was mostly haunted by how small my bathroom was. On our first night in town, we ventured down Essex St., seemingly ground zero for psychic, curiosity, and witch boutiques, to Rockafellas. It's another classic building with gorgeous wood floor and lots of windows looking out over a fountain marking Salem Village's original well and a statue of Samantha, perhaps TV's favorite witch of all time. 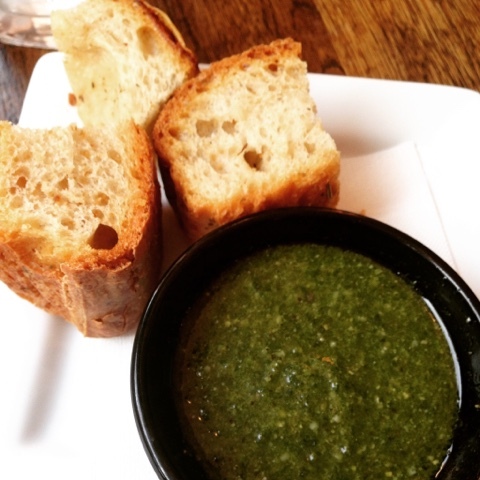 Our meal at Rockafellas began with cubes of crusty, chewy semolina bread with emerald green pesto. The sauce was looser than I usually make pesto, and I know enough about food to realize this meant it was made with enough olive oil to float a witch, but I enjoyed the strong flavors of licoricey basil and nutty Parmesan cheese anyway. The day after sandwich was a witty idea to serve in a New England restaraunt, close to where Thanksgiving dinner originated. The smoked turkey, cranberry-walnut relish, and sage stuffing were soothing after a frazzled day of travel - lighter than one would guess, and each ingredient sung its own song while also reminding the palate of the holidays. The sweet/tart berry relish was doing a lot of heavy lifting, with the earthy walnuts in the mix to provide crunch. Rather than a turkey gravy alongside, Rockafellas served a cream gravy, which was a departure from the expected, and added depth to the overall flavor of the dish. We returned to Rockafellas a few nights later for our team dinner, and enjoyed the potstickers, pulled pork sliders on tiny, crumbly biscuits, and spicy chicken kabobs quite a bit. 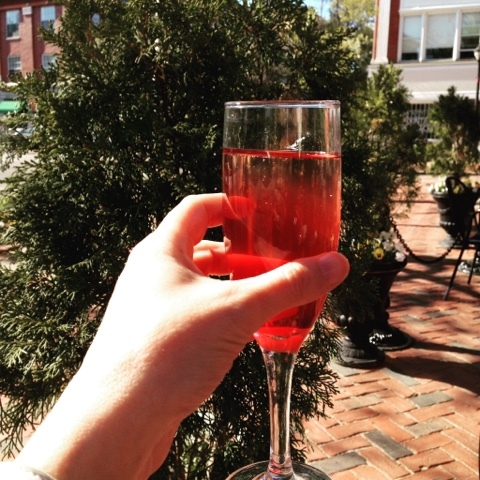 The patio out front is terrific for finding time to fit in some day drinking and while away until the witching hour in Salem. We also walked around Salem that first evening and enjoyed the cool fountains and architecture that lend a sort of hushed, reverential feeling to this hamlet. Another night, it was Diners, Drive-ins, and Dives that led me to dinner at the Lobster Shanty with my friend and colleague Shannon. This joint is a dive in every sense, with uber casual service, dark corners, and no-frills ambiance. Nothing Fieri had reviewed was on the menu by the time we made it here, but his countenance remained spray painted on the bulkhead over the bar. 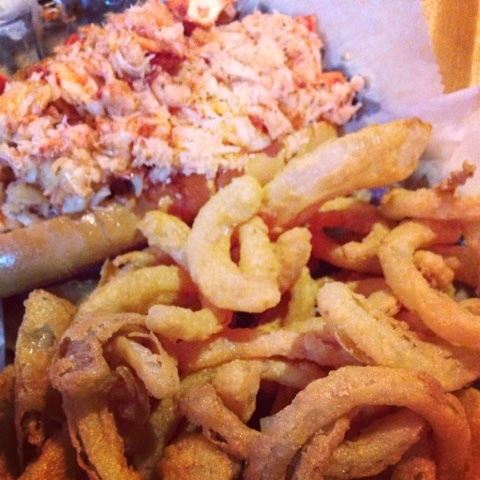 I went for a lobster roll, naturally. In this case Conneticut style, which means dressed with butter rather than mayo; a version I'd never tried before. Honestly, it was a bit too greasy and rich for me, which makes me sad. It could be that, despite my general aversion to mayonnaise, the creamier aspect of that condiment is more suited to balance the lush sweetness of lobster meat. The pile of onion rings I ordered with the sandwich were also greasy, and so Big Hungry moniker notwithstanding, I came nowhere near close to finishing this dish. I will say, however, that the portion size here was massive - this was a two handed, five napkin sandwich, no joke. 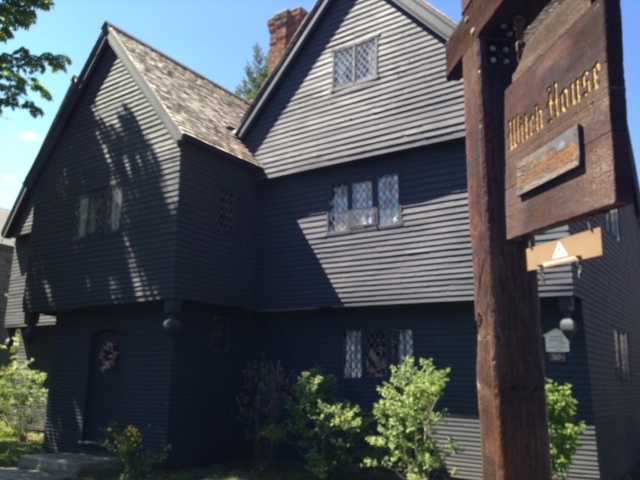 We did get to enjoy a few touristy indulgences during this work trip, and my favorite was the Witch Musem, just across the street from our hotel. 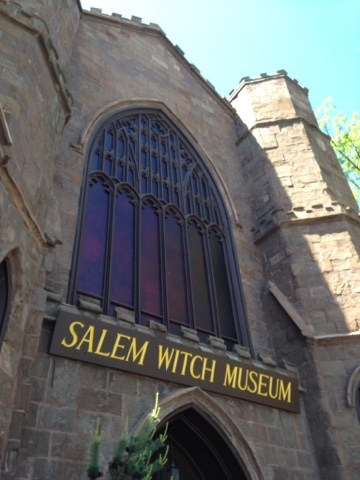 The museum tells the story of the Salem Witch Trials, via a strong voice on the persecution faced by these ordinary citizens based on accusations by a few silly teenaged girls, as well as some history of obstacles faced by Wiccans and the role of witches in popular culture. It's a small museum, but very well done, and the building is cool as Hell. The night before, we'd had another team dinner at Turner's Seafood, an easy walk from the Hawthorne Hotel. 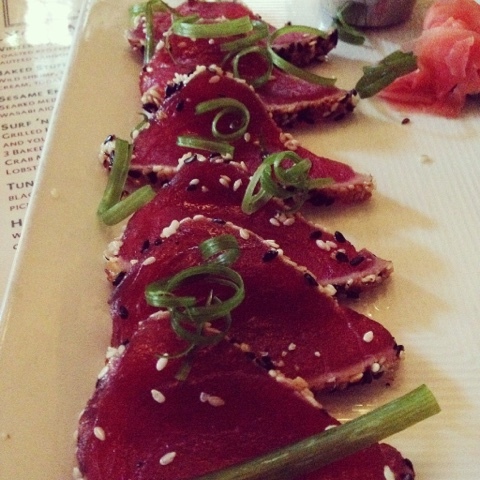 My favorite bites here were our starters - buffalo calamari and tuna sashimi. But I will say, though extremely loud inside, the restaurant itself was gorgeous, all white subway tile, brass and dark wood finishes, and great service. 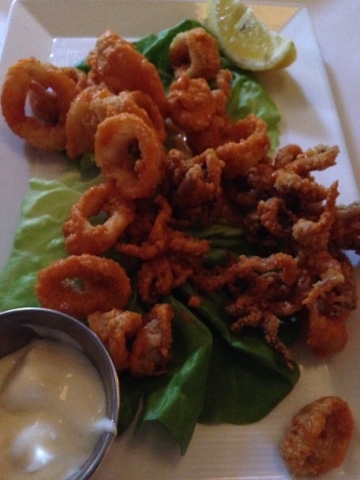 The calamari were wonderfully spicy after their hot sauce bath, but not greasy or saucy, which suited me. The squid was tender, and the breading still crisp despite its buffalo treatment. The tuna was extremely high quality, with the conventional but well balanced flavors of scallion and ginger pinging off one another to great effect with the clean fish taste. 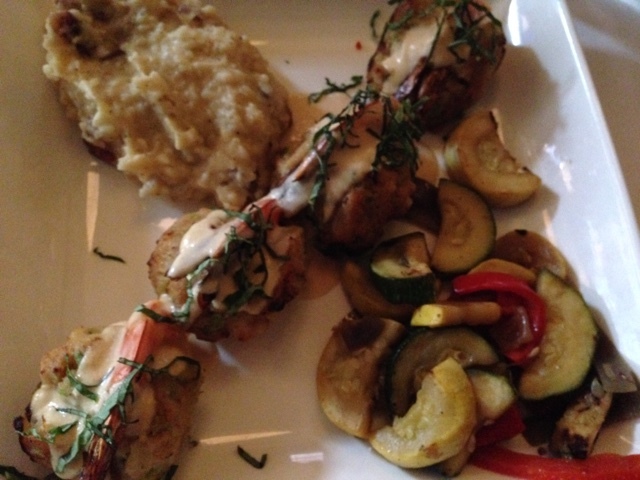 For my entree, I selected stuffed shrimp. It was extremely heavy and the shrimp were a little overcooked. The seafood vegetable stuffing would have benefitted from more herbs and less bread, and both the lobster cream sauce and mashed potatoes accompanying the protein were clunky, with little flavor. A whipped potato or rice would be more apt with the shrimp, and more green on this plate than the sprinkle of basil chiffonade was sorely needed. Even the smarty sautéed summer vegetables on the side weren't enough to rescue this dish. It would be a really hacky writing move to tell you that I fell under the spell of Salem, but there's some truth to it. The six or so square blocks, including waterfront areas, the House of the Seven Gables, Essex Street, and the very cool Crow Haven Witch House maintain a vibe carefully cultivated by both the Wiccan community and tourism council here, and every step feels connected to those scary months when witch hysteria swept this place. This is a walking village, and we spent four days here without ever using our rental car. I think it's a very cool place for a weekend getaway, just about a six hour car ride from the Southern Tier, and convenient to Massachusetts shore towns as well as Boston. 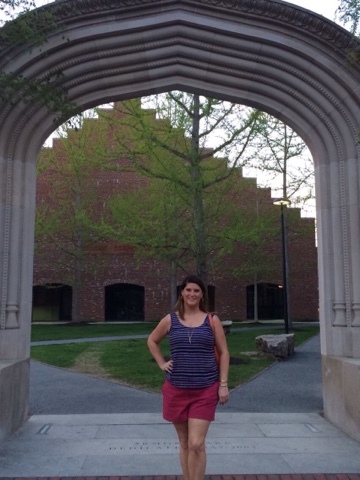 Let me know what your favorite eats are in the Witch City, Hungries! My personality is big; my hunger is bigger!